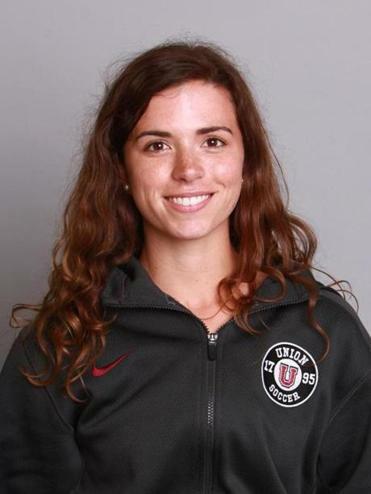 A senior defender and two-year captain, Aly Leahy helped Union College to an 8-5-3 record to close out her collegiate soccer career. Leahy, of Newburyport, has been part of a one-two punch from north of Boston during her time with the Dutchwomen. Forward Katie Monahan of Ipswich, who played at Ipswich High, was also a senior this season and a two-year Union captain. An economics major, Leahy was the Globe’s Division 3 Massachusetts Player of the Year in 2013 when she led Newburyport to a state championship. She also played four years of basketball and a couple years of lacrosse in high school. Q. Were you and Katie Monahan big rivals in high school? A. We played against each other for four years on our high school and club teams. She’s a center forward and I’m a center back, and we went toe-to-toe quite a few times. But I didn’t really know her until senior year of high school and we were rivals, and then we ended up becoming best friends and now we’re roommates. It’s kind of a cool experience. We don’t think about it too often but here are two girls from [north of Boston] who grew up playing against each longer than we know and we end up at the same school in upstate New York. It’s kind of a special thing, and I’m really happy it worked out this way. Q. What’s your best athletics memory from Newburyport? A. I think senior year when we went undefeated and won the state championship. That had been the goal of ours since we were in fifth or sixth grade and watched an older group of girls do it. To have it finally come together as seniors was pretty neat. We beat Granby, 1-0. It wasn’t our finest showing, but we got it done. Q. What do you plan to do with your degree in economics? A. Actually, I have a job. It’s at Nomura, a Japanese bank, and I’m going to New York City to work in equity derivatives on their sales and trading desk. I interned there this past summer and it turned into a fulltime offer. It’s pretty exciting and it was quite a relief going into senior year. I’ll miss Boston, but I’m excited to try something new. The city is so big and there’s so much to do all the time. I think it’s a good place to be right out of college. Q. What’s your dream job? A. Maybe way down the line to own my own coffee shop. Something like that. Q. When you’re not practicing, playing, or studying, what do you like to do in your free time? A. I really like the outdoors and hiking and all that stuff. I’m into photography. All those types of activities. I grew up snowboarding. We’d go to Burke Mountain in Vermont. Union offers ski trips every Saturday through the winter. You have to go at 7 a.m. every Monday to sign up and it’s like $20 for transportation and a lift ticket. It’s a great deal. Q. What’s the best piece of advice you’ve received from a coach? A. You can learn more from your losses than you can from wins sometimes. As much as it hurts to lose, sometimes that’s the best way to learn from your mistakes. Q. How long have you played soccer? A. Probably since I was 4. It’s always been my main sport. I probably would have chosen just to play soccer. My parents wanted me to play a few sports and left it to me to make the final decision. I found my friends through soccer and it gave me so much more, too. Q. Do you have a favorite professional team? A. I’d have to say the Patriots. Q. And a favorite Patriot? A. Of all time? Tedy Bruschi. I grew up in a family where we’re all huge Patriot fans and he was always front and center when I was younger. We named our dog Bruschi. He’s a labradoodle. Allen Lessels can be reached at lessfam321@gmail.com.